This spring, the Deer Creek Watershed Alliance recognized with an award the extraordinary contributions of one woman, Cindy Gilberg, to a movement that is powerfully changing how people across St. Louis relate to nature, through native plants. The award was presented by Rick Holton, Deer Creek Alliance Chairman, and Dr. Peter Wyse Jackson, President of the Missouri Botanical Garden. Her work over more than 35 years has cultivated appreciative use of these hardy, hard-working, versatile plant groups among her fellow horticulturists, homeowners, and conservation experts. As a speaker and teacher about landscaping with natives, Cindy has motivated thousands in our region and beyond to welcome natives into their garden plans. Cindy’s talent for garden design flourishes along every fabulous path of the Whitmire Wildflower Garden at Shaw Nature Reserve. In this public education and recreation setting, the capable characteristics of native and adapted plants are showcased beautifully. Gifted also as a writer, in 2010 she shared her love for the history of this natural wonder as co-author with her mother, popular gardening authority Barbara Perry Lawton, of a book celebrating Shaw Nature Reserve’s 85 years. But it was not enough for Cindy to work with native plants herself. For nearly three decades she and her husband Doug provided them as co-owners of Gilberg Perennial Farms. St. Louis gardens are more attractive, with less maintenance, and are much more hospitable to birds, butterflies, amphibians and other species thanks to Cindy’s early leadership in growing and selling natives. As a major contributor to the expert team that recently developed a body of RainScaping resources, Cindy helped mainstream these options. Her experience ground-truthed these practical strategies, anchored by native plants, to conserve water, save money, and assist public agencies. The detailed results are available online for free at www.mobot.org/RainScaping. These efforts all support a local incentive program, RainScaping Rebates, that is helping St. Louis property owners invest in the kinds of “green infrastructure” projects essential for our region to deal with rainfall extremes due to climate change, plus water quality and biodiversity issues. Her legacy is a cascading success. This month, some of Cindy’s friends and colleagues add their personal accolades to her official honor. Becky Homan, former gardening editor for the St. Louis Post-Dispatch, says, “Cindy is a local gardening legend. When Gilberg Perennial Farms was open (for 28 years, in far west St. Louis County), budding urban gardeners would make the 40-minute trek – almost a pilgrimage – to see the wealth of innovative flowering and foliage plants that Cindy packed into her country place. She and Doug were pioneers in the wave of popularity for perennials that only crested some 20 years later. a high-maintenance or invasive imports to an appreciative awareness of the large palette of indigenous plants. “Cindy’s teaching and consulting has long been a resource for anyone wanting more information. Her topics have ranged from gardening for wildlife to prairie restorations to rain gardening for conservation in water management. 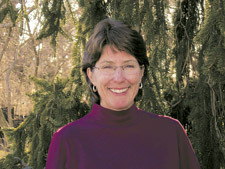 Kim Petzing – now Recycling Education Coordinator for Madison County, Illinois – joined with Cindy in 2012 to educate homeowners and landscapers who wanted to apply for RainScaping Rebates. Kim says, “Cindy has a way of speaking that makes people want to listen to what she has to say. As we taught folks how to use native plants in RainScaping, I found myself making notes of how she talked about garden designs. Cindy loves dragonflies. She wears them as earrings, on scarves, and in the patterns on her clothing. We both fancy these vivacious living creatures and Odonata paraphernalia. Dragonflies are one bug that means business. They are predators – and their species has persisted on the Earth for millennia. Cindy shares traits with her winged totem. I remember them about her from our first meeting. I went to Gilberg Perennial Farms with friends – skilled gardeners, which I was NOT – back in 1990. My pals introduced me to Cindy, clearly a woman who knew her business, in charge, front and center, and giving her customers THE BEST PLANTS POSSIBLE. Along with her knowledge and expert advice, delivered rather briskly. I decided to shadow this Force of Nature, from just outside her field of vision, but I had to keep moving. I thought she might have eyes in the back of her head. The most amazing thing I observed was not that Cindy knew so much, it was how she met her customers where they were, and invited them to grow from there! How she empowered each person to want to know more, to want to grow her “wild flowers” and strange water garden plants, and enjoy them and SUCCEED! I listened to Cindy asking questions, not just tell what-all she knew. I watched her customers drinking up her knowledge for sure, and I also saw folks feeling “I could do this!” as they hiked along around her place. She wasn’t just selling plants, though I could hear cash registers ringing. Cindy was trading in ideas and confidence. Encouraging people to try new things. Like a purposeful dragon skimming along, she zapped misinformation. She super-seeded her native plant passion into her customers’ minds and hearts – and into their gardens. Praise all around for Cindy Gilberg, a natural treasure! From authorities, colleagues, customers and friends! All so blooming well deserved! Jean Ponzi also promotes native plants as the Green Resources Manager for the EarthWays Center of Missouri Botanical Garden, inspired and informed by Cindy. This entry was posted on Saturday, June 28th, 2014 at 1:57 pm and is filed under July 2014. You can follow any responses to this entry through the RSS 2.0 feed. Responses are currently closed, but you can trackback from your own site.